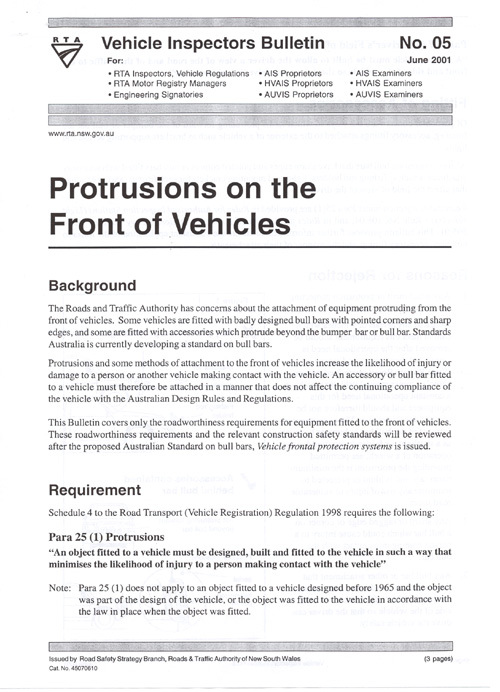 The Chairman of the PCA, Mr Harold Scruby, today congratulated the NSW Government, Minister for Roads and Transport, the Hon Carl Scully, the RTA (Roads and Traffic Authority of NSW) and the NRMA on being the first state in Australia to ensure that equipment protruding from the front of vehicles complies with Australian Design Rules and Regulations (attached, today’s RTA press advertisement). 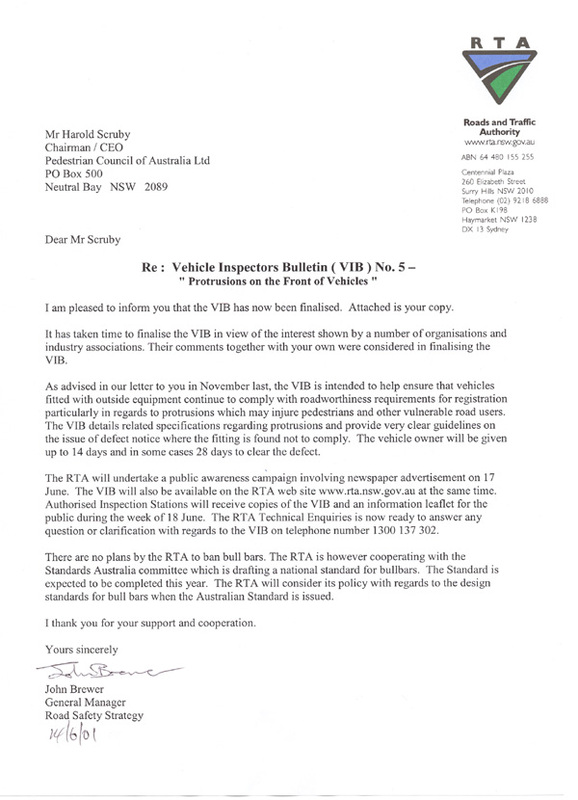 Mr Scruby said: "For over a year now, we have been working with representatives from the NRMA and the RTA in order to create inspection standards which will vastly improve the style and type of bullbars and attachments fitted to NSW vehicles. While this is not the perfect solution, it is a politically achievable result until Standards Australia finalises its design standards for bullbars. 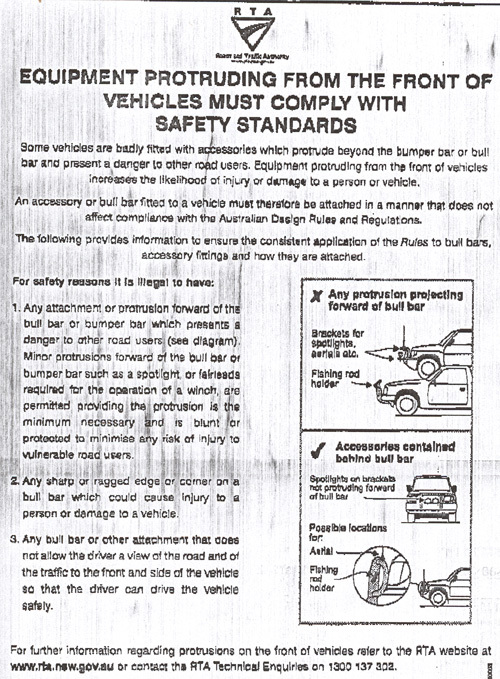 Mr Scruby added; "Apart from the extraordinary and inordinate amount of death, injury, grief and suffering caused by bullbars to pedestrians and the occupants of motor vehicles (let alone the damage to property), the former Federal Office of Road Safety (FORS), now the Australian Transport Safety Bureau (ATSB) expressed their serious concerns about these devices. Mr Scruby said: "This initiative will save countless lives and limbs. We now look forward to all the other states and territories following the NSW example. In the meantime, we will be calling upon the NSW Minister for Police, the Hon Paul Whelan, to ensure that the NSW Police Service is immediately informed of these safety standards so they can issue defect notices where appropriate. 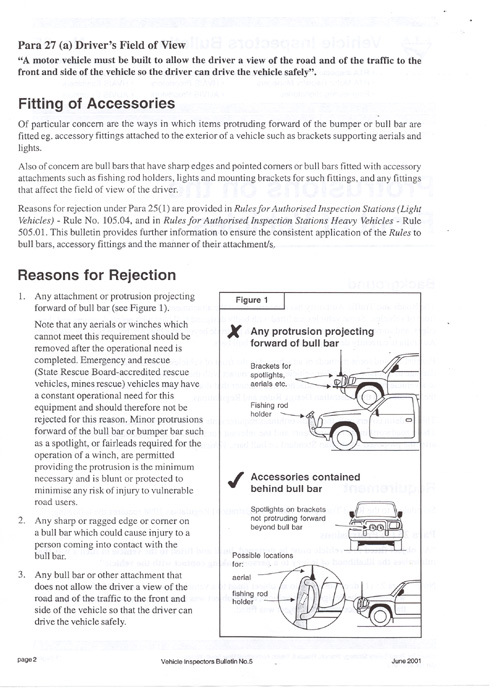 As a matter of urgency, we are appealing to police to “target” the backyard “killer bullbars” which have become the B&S/jackeroo utility cult icon and vehicles fitted with lethal protruding attachments such as knife-like fishing-rod holders (see attached photos or visit: http://www.walk.com.au/pedestriancouncil/Page.cfm?PageID=130 ).